MUBARAK DENTAL not only has doctors with varied qualifications working here but also is a complete soul in Itself. We are MUBARAK DENTAL and our Team of Dentist is waiting to perform their "Magic" on your smile . 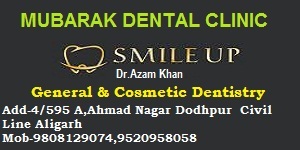 MUBARAK DENTAL is an Exclusive state of the Art in the heart og Aligarh Dental Clinic are committed in Providing the best Dental Care Possible in Order to improve the Patient's Facial Esthetic and Function with advance Dental Treatment .Providing quality Traetment at affordable cost with convenient Installment Scheduling. 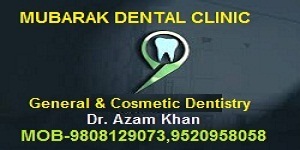 We are commited in Providing the best Dental Care. FOR - Free Treatments of Child whose age 10 years old and also Parents Free Dental Checkup . Free on Every Sunday to Deport The Tooth.